When society started to specialize and build hierarchies, this also refers to theatre. It is here we first see how court theatre mark off. The rites are no longer collective. The shaman, the priest or the king, who has gotten their power from the gods, are leading the rites in the role as their representative. The rites are no longer forcing the gods, instead they contains prayers and sacrifices. Through trance, song, rhythms and illusions the rites becomes the link to another “more real”, holy reality. When society starts to build hierarchies the court theatre becomes exclusive. It gets played by and for a chosen elite, male and female theatre becomes held apart in initiation, hunting, fertility and other rituals. Also actors and audiences become held apart, so that the audiences got a passive, non-participating role. The court theatre discuss conflicts between individuals or/and individuals versus society. It strives to support and legitimate the elite in society and to make these conflicts eternal. Vulgar Comedy on the other hand is simpler and more direct; it developed from the primeval clan fellowship. It’s task is to mock and dethrone the ”eternal” in order to make room for an open attitude to the world. Instead of individuals and effective built conflicts Vulgar Comedy focuses on spontaneity and characters and masks and comedy is off course always important. According to Michail Bakhtin, who certainly talks about the medieval times, laughter was the motor not only in theatre and in games but in the basic attitudes among common people. He also talks about “the material-bodily lower” (excuse my translation) as something merry. It represents life, reinvigoration, fertility, renewal, and well-being. It is there where Vulgar Comedy has its roots. 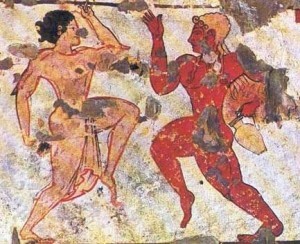 It is also possible to see the history of Vulgar Comedy in the Greek mime, a history that stretches itself long before 500 BC, when the official Greek theatre was born. It has always been the theatre of the peasants, the slaves and the working classes, with a collection of characters of whores, thieves and chandlers. It was far away from the kings, heroes and gods of tragedy and the ridiculous but honest citizens’ of official comedy. 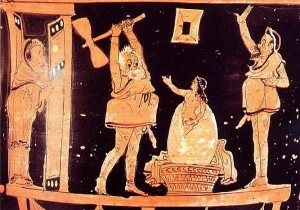 The Greek mime also had direct connection with pre-Dionysian fertility rituals, with its fat stomachs, gross asses and big phalluses. Here we also can see similarities to the phalluses on Scandinavian stone carvings. This was Part 2. The story continues… Se Part 1, Part 3 and Part 4 . This entry was posted in 2 Vulgar Comedy and tagged blog, blogg, buffoon, carnival, comedy, commedia, court theatre, dramaten, history of theatre, holy theatre, jesters, king, Klingvall, Kompani Komedi, Micke Klingvall, physical theatre, rite, rites, rituals, royal, royal theatre, royalties, scandinavian theatre, swedish theatre, theatre, theatre history, theatrehistory, vulgar, vulgar comedy, women in comedy, women in theatre. Bookmark the permalink.